Citizens of the Renaissance city of Udine are living longer, amplifying a demographic trend in the whole of Italy. In the last decades Udine has experienced a steady growth of its elderly population, the old age index having stabilized about 15 years ago to a little over 200 and the older people representing 31.6% of the total population. Nowadays senior citizens in Udine are therefore a very important segment of the population. Since healthy life expectancy has not increased in parallel to life expectancy itself, elderly people often require greater health and social assistance. However, provided aging is conceived as still an active phase in life, senior citizens can become a truly valuable civic asset in developing a sustainable, responsible, and morally resilient society. For this reason our city has been very much committed to promoting Active & Healthy Ageing, by being part of European and international networks and by raising awareness about this theme at the local level. The result has been a series of actions and activities to be included in a systematic and strategic policy aimed at promoting older people’s healthy ageing and at better meeting their needs. Taking the older age group as a priority area, different approaches were combined to raise awareness on demographic ageing. Becoming a member of the Age-Friendly Cities Network and of the Healthy Ageing Task Force within the WHO Healthy Cities Programme (since 2004 Udine is also the leading city) with the aim of sharing knowledge, tools and experiences with cities and developing new actions to face the demographic change. Producing a Healthy Ageing Profile, whose goal was to allow for an overall understanding of the local context and to provide evidence as a basis for setting priorities and taking decisions. The profile provides quantitative and qualitative information on the health and the living circumstances of older people and has lead to the development of a stable healthy ageing city observatory. Mapping the distribution of the elderly on the city territory (using GIS) and matching with the provision of public, health and social services offered to the community (such as general practitioners, post offices, free time opportunities, care centres, chemist’s, bus stops, etc. ), by designing the “health maps” of the urban environment. Pioneering the ‘Vancouver Protocol’ which asked citizens, caregivers and services providers to evaluate characteristics of an age-friendly city in eight different domains and suggest inprovements. Results were incorporated into the WHO Global Guide and used locally to determine investment priorities. 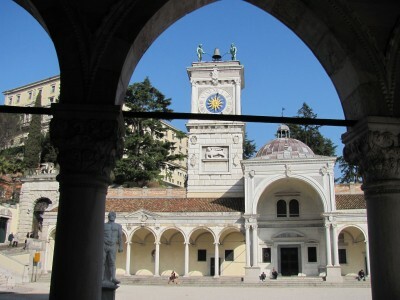 Udine also participated in a pilot study on measuring the age-friendliness of cities that fed into a new guide on using core indicators developed by the WHO Centre for Health Development. Carrying out a European project on Healthy Ageing within the URBACT programme, aimed at sharing, improving and transferring good practices among cities (Edinburgh, Brighton & Hove, Grand Poitiers, Klaipeda). Joining the Covenant on Demographic Change (December 2015) and participating in the activities of many European Organisation and programmes, such as AFE-INNOVNET, the European Innovation Partnership, the Joint Programming Initiative (JPI) Urban Europe, the AGE Platform Europe, the AFEE – Age Friendly Environments in Europe. Promoting opportunities for older people to remain physically, mentally and socially active as long as possible through actions and initiatives at the local level. The city of Udine has tried to create supportive environments and established patterns for healthy living through food and mobility policies oriented to the elderly. A number of projects have been started to enable and encourage increasing physical and mental activity among population in later years as a very effective way of preventing and lowering the high costs associated with health and social services and fostering intergenerational relationships.